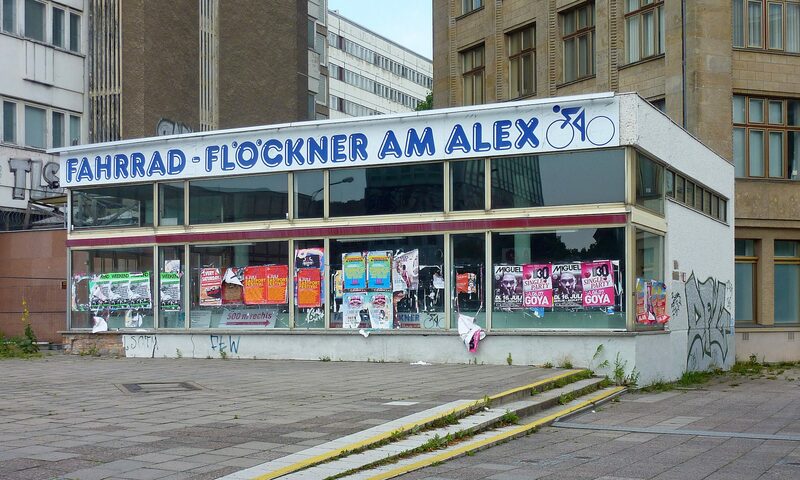 Germany is usually not known for its overly exciting domestic politics. Recently though, things have gotten more interesting. As will be recalled, the German Bundestag took an unusually long time to elect a new chancellor. Then, there was the summer drama over migration that brought the recently formed coalition to the brink of collapse. Now, Germany’s established political parties are trying to react to their dwindling electoral support. Chancellor Angela Merkel’s announcement to step down as a party leader has sparked a battle over the CDU leadership as well as over the party’s future direction. Andrea Nahles, chairwoman of the social democratic SPD, has disowned the party’s own successful labor market reforms in an attempt to play to a more left-wing base. From an electoral perspective, which strategy is likely to prove more successful? As we have noted before, the CDU’s supporters are thoroughly centrist. This does not bode well for either Friedrich Merz or Jens Spahn, two hopefuls for the CDU’s chairmanship. If anyone can benefit from these centrist preferences, it should be Annegret Kramp-Karrenbauer, the pragmatist champion of those party members who are still supporting Angela Merkel. The same is true for the electorate as a whole. Using data from the GLES 2017 post-election study, we looked at respondents’ preferences over policies on two dimensions. The first dimension is an economic dimension and conforms to a standard notion of “left” vs. “right” politics with respect to taxes, redistribution and the role of government in the economy. The other dimension is a societal or “new politics” dimension that captures preferences over authority vs. liberty, marriage equality, abortion and multiculturalism. Higher values denote more conservative or right-wing preferences. The figure shows the (representative) distribution of German respondents’ preferences on these two dimensions together with the 2017 positions of political parties, based on data from the Chapel Hill expert survey. On an economic dimension, the bulk of voters holds preferences that are smack in the middle between “left” and “right” economic policies. On a societal dimension, more conservatives positions, gauged by surveying preferences on immigration laws, are slightly favored over more liberal policies. It is hard to see how a party strategy of becoming more extreme could be electorally beneficial under these circumstances. Especially the SPD would be ill-advised to move to the left on either an economic or a societal dimension. Not only are potential voters thinning out in these areas of the policy space, there are also two competitors – the Greens and the Left party – that are already firmly established in the respective corners. 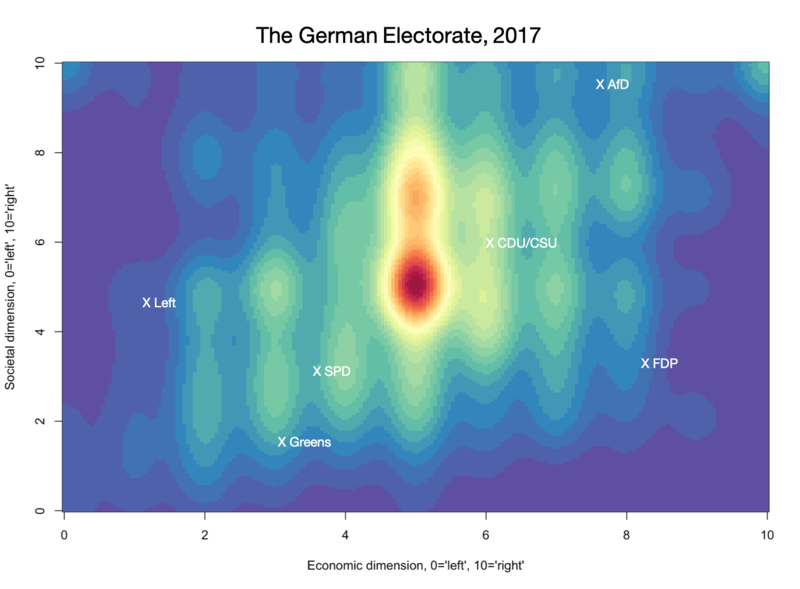 For the CDU, the dangers lie in alienating the bulk of voters in the center of the distribution. By moving to the right, the CDU might lose more than what they have to gain by adopting more conservative positions, especially if these positions were to resemble those of the AfD. It remains to be seen if politics in Germany revert to their old less-than-exciting but thoroughly successful ways or if Germany is facing a period of self-inflicted political turmoil with parties veering off to the extremes. Voters, for one, would resoundingly prefer the former. Previous PostPrevious Where should the CDU look for a new leader? Smack in the middle!